Xander, a 2-year-old Pug, may be blind, but he has the heart of a hero. When Xander was just a puppy, he suffered a serious head injury. As a result, veterinarians had to remove both of Xander’s eyes. Then, when Xander was 10-months-old, his family surrendered him to the Klamath Animal Shelter in Klamath Falls, Oregon. Though Xander was scared, shelter staff could tell the little Pug had a kind, gentle disposition. Xander’s owner, Oregonian Rodney Beedy, was absolutely taken with Xander from the get go. Beedy visited the shelter one day on the hunt for a new four-legged friend, and he looked no further than Xander. Beedy adopted Xander on the spot and brought him back home, where he fit in right away. As soon as Xander adjusted to home life, Beedy and his wife Marcie enrolled the little love bug in therapy dog certification classes. Today, Xander is busy visiting nursing homes, schools, and hospitals. He also helps bring hope to victims of child and spousal abuse. And Xander doesn’t need eyes to see when someone is in need of his help. 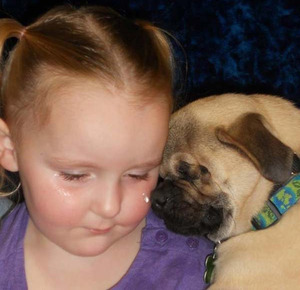 The therapy Pug seems to have a sixth sense for people who are struggling — especially children. “A lot of times he’ll hear a child crying at an event and he’s bolted several times, at least 500 feet over to this child to comfort them,” Beedy explains. Want to learn more about Xander and the people he’s helping? Check him out on his Facebook page or visit his website, MeetXander.com.